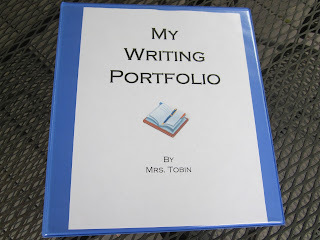 Start gathering student writing samples and create Student Writing Portfolios at the end of the school year. Students choose writing samples from throughout the school year and organize them into a scrapbook. We finish up our writing portoflios around Mother's Day, and the finished product makes a great gift for a parent! In addition to writing samples, students prepare a letter summarizing their year. They include personal highlights and accomplishments in the letter to themselves. Most of my former students (and parents) tell me that they still have their writing portfolios and will look back through it years later.